The medical device market is always advancing technologically, as with most other industries. One new technological development, the Continuous Glucose Monitor (CGM), provides added peace of mind to diabetics by providing 24-7 information about blood sugar levels. This constant feedback provided by the device allows for better short and long term control of your diabetes, which will also improve your A1C levels. The device is comfortable to wear and decreases the number of finger pricks you need to perform daily to check blood sugar. Patients who use a CGM often only need to test their blood sugar twice per day. Two finger pricks per day is much better than the typical number of ten times! This is a huge step forward in diabetes management. 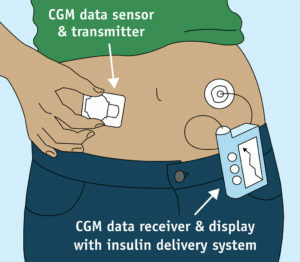 A CGM system includes three components: a sensor, transmitter, and receiver. The sensor inserts into your skin and uses the same enzyme as a test strip (glucose oxidase) to measure blood glucose. The glucose oxidase in the sensor converts the glucose in your blood to hydrogen peroxide, which reacts with the platinum in the sensor. This reaction sends a signal to the transmitter, which inserts into the sensor. 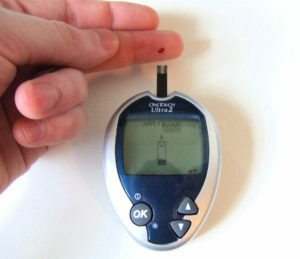 The transmitter then communicates with the receiver (or other connected device), notifying you via alerts if your blood sugar is trending high or low. Sensors need to be replaced every seven days. Here at Active Healthcare, we have a number of patients benefiting from CGM. Our patients appreciate the ability to analyze their blood glucose results and adjust their basal levels accordingly instead of guesstimating from multiple manual tests. We offer two Dexcom systems, the G4 Share and the G5. The G5 is Dexcom’s newest model and pairs with a smartphone or any Apple device, eliminating the need to carry your receiver around. This is especially good for patients who already carry a lot of supplies and devices around to manage their diabetes, such as students. Both systems enable the patient to share device information with up to five other people. We also provide the ongoing supplies for our CGM patients and can send these in the same shipment as your regular diabetic supplies. Many insulin pumps are now integrated with CGM including the Animas Vibe and Tandem G4. The newest Tandem pump, the t-slim X2, will have compatibility with this feature later this year. Because the CGM is a complex device, it is recommended that patients get as much information and training as possible both from their physician, diabetic educator, and the various manufacturers before beginning its use.